I enjoy cooking and eating; especially eating. Many years ago, my wife decided to become a vegetarian and ever since my whole food world has changed. And while I am not personally a vegetarian, I’m married to one which for all intents and purposes is exactly the same thing. The big reason is meat for the most part isn’t allowed in our house. I once read “Meat is murder, tasty, tasty murder” on a bumper sticker. And while I like to say it around the house just to get a rise out of my wife, the reality is she doesn’t really want our kitchen to be the scene of this type of heinous food crime. As such, we rarely have meat in our house and really only when she is out of town, or we are entertaining carnivores. When we moved to Tennessee, she did add fish to her diet as a source of protein, because, as you can imagine, the south isn’t the capital of vegetarianism and there isn’t an abundant supply of restaurants or grocery stores with good options. Basically zero. So I am allowed to dress out a salmon every once in a while in the old abode, but even that is pushing it. I will say that when the rest of the family is out of our house, we do tend to eat meat. The kids have always eaten meat while at school and when we go out to restaurants most of the time we order some sort of meat dish. As I have gotten older, I have found that I don’t need a whole portion of most restaurant meals and share on occasion with my wife. But most of the time, I just order some sort of meaty morsel just because it is not usually an option, and just gain a few unwanted pounds. So recently, my wife decided to give up sugar. Joy, meat and sugar. But while describing all the horrible things about sugar, she mentioned that white flour does exactly the same thing in your body. Exactly. So instead of giving up the sugar food group staples like pie, molasses/oatmeal raisin/peanut butter/chocolate chip cookies, and of course caramel anything, which would indeed be crazy, my daughter and I instead eliminated white flour from all our recipes. I am happy to report through almost constant trial and error; we have perfected cookies, cakes, and scones and will be focusing our work on pie crusts soon. 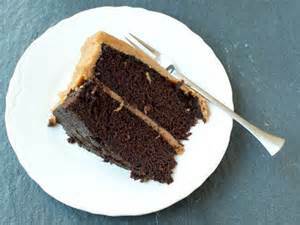 Her last chocolate cake with half German Chocolate cake and half caramel icing was probably the best cake I’ve ever tasted or more accurately devoured. So while my wife’s meatless, sugarless life leaves her healthy and thin, her most recent health push has actually caused me to gain weight. How does it always work that way? I will say she is a little perturbed we decided to perfect recipes after she gave up sugar, so I do have that going for me. Now, If I could just find a way to work off these few extra pounds in a form I don’t actually hate, I won’t have to give up the pie quest.